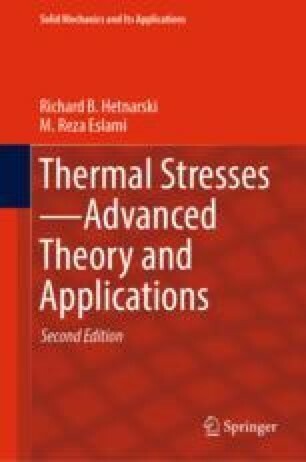 A structure under thermal shock load, when the period of shock is of the same order of magnitude as the lowest natural frequency of the structure, should be analyzed through the coupled form of the energy and thermoelasticity equations. Analytical solutions of this class of problems are mathematically complex and are limited to those of an infinite body or a half-space, where the boundary conditions are simple. This chapter begins with the analytical solutions of a number of classical problems of coupled thermoelasticity for an infinite body, a half-space, and a layer. Coupled thermoelasticity problem for a thick cylinder is discussed when the inertia terms are ignored. The generalized thermoelasticity problems for a layer, based on the Green–Naghdi, Green–Lindsay, and the Lord–Shulman models are discussed, when the analytical solution in the space domain is found. The solution in the time domain is obtained by numerical inversion of Laplace transforms. The generalized thermoelasticity of thick cylinders and spheres, in a unified form, is discussed, and problems are solved analytically in the space domain, while the inversion of Laplace transforms are carried out by numerical methods.